In their never-ending war against pirates, the ninjas are about to win the battle of handhelds. 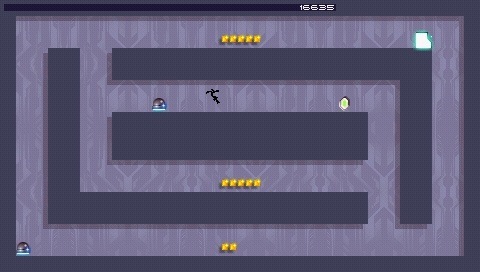 In March, the popular flash game known as N will make a very floaty leap to the PSP and DS. Known as N+, the new versions will contain the original N in its entirety, as well as new levels and features. For those of you not familiar with the original, you play as an unnamed ninja whose goal is to conquer 2D levels by reaching the exit. Along the way, you will need to avoid murderous robots and hazards. Though seemingly pedestrian, N succeeds through a superior physics engine. The controls are wonderfully smooth. Once the controls of the game become familiar, maneuvering the ninja is reminiscent of the sport / art form of Parkour. Flow, style, and speed are all essential. It is reminiscent of the best moments of old-school Sonic the Hedgehog games: traversing a level fluidly without stopping. There's not many better moments in gaming than the feeling of completely owning a level. With time and practice, N+ will give you that opportunity. In addition to its gameplay, another reason that N succeeded was because of the level editor and its online community. The handheld versions hope to replicate this by allowing users to create their own levels to play and share through the DS's Nintendo Wi-Fi Connection and the PSP's infrastructure mode. Whether it be a hellishly difficult level created by Satan himself, or a DDA (Don't Do Anything) where you can watch the character complete a level Rube Goldberg-style without touching a button, N+ has the opportunity to greatly expand its replayability. Hopefully, N+ will see a level of support comparable to the original. The limited amount of screenshots and videos available show that the main difference between the PSP and DS versions is the perspective. The PSP version will display as much of the main map as possible, with minimal panning. The DS will use the top screen to show a map of the entire current level and the bottom screen to show the zoomed-in view of the player. Hopefully, the DS version makes use of the touch screen for easy level creation. Also, it remains unclear if PSP users can share their levels with DS users, and vice versa. It will be interesting to see how the conversion from flash to portables is handled. Hopefully, the developers manage to make N+ faithful to the original and simultaneously an advancement. N+ comes to the PSP and DS on March 18th.